« Editorial Cartoon: Barack Obamas State of the Union-tal! Media: Winston Churchill döpte tidskrift! HISTORIA: Under januari firar tidskriften History Today 60 år. Enligt Richard Cavendish, kolumnist på tidskriften, var det Winston Churchill som fick idén till namnet. Här ser vi omslaget till första nummret. The magazine’s founder was Brendan Bracken, Conservative MP, resourceful publisher, charming gatecrasher and close ally of Winston Churchill. An excellent Minister of Information in 1941-45, he was detested by his civil servants, who cheered when he lost his seat in the 1945 general election, and is said to have inspired some aspects of Big Brother in George Orwell’s 1984. 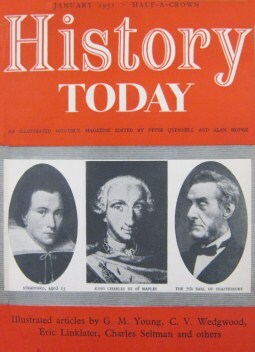 He discussed his idea for a new history magazine with ‘the Boss’, as he called Churchill, and the story goes that after a fierce session in the House of Commons they both retired to the smoking room, where Bracken told Churchill, ‘We have made history today’ and Churchill told him that was the ideal title for the magazine.